The Iyengar Yoga method is recognised and respected as one of the most deeply faceted forms of yoga. It is practical, physical, philosophical and spiritual in its approach. An Iyengar Yoga teacher is distinguished by the rigour and depth of their training and their ongoing commitment to the Art and Science of yoga. Iyoga Project offers teacher training for experienced and dedicated Iyengar Yoga students who wish to deepen their own personal practice while undertaking comprehensive Yoga Teacher Training in the Iyengar Method. 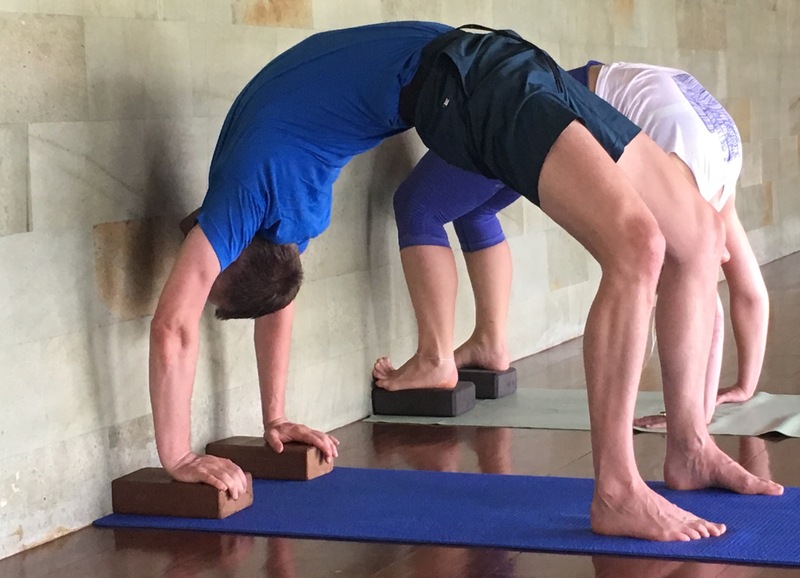 While the Australian Iyengar community endorses programmes with recognised teacher trainers that are conducted under the Association guidelines either as an apprenticeship or group course format, Tamar facilitates her Teacher Training Program and Continuing Education Series (further education for already qualified teachers wishing to sit for assessment at higher levels) in the form of an apprenticeship. This is with respect to the wishes of the Iyengar Family, who favour this way of training a teacher, and also follows on the tradition of training that Tamar experienced. A student wishing to train as a teacher must have been practicing Iyengar Yoga regularly for a minimum of three (3) years before undertaking training with a BKSIYAA-accredited teacher. An interview with Tamar is required to assess readiness to embark on the training. Introductory level training minimal requirement is attendance of 300 hours of a recognised teacher training course and 100 hours of assisting and adjusting with their teacher trainer. A referral from Tamar is required to register for assessment. This referral is subject to skill level achieved. Some trainees require and request more than the minimum specified time on the Program to be ready for assessment. The emphasis is on an individuals own process and journey. To become a certified teacher at this level the candidate has to pass an assessment involving a written examination, the presentation of a two hour practice, and a thirty (30) minute teaching segment in front of a panel of recognised assessors. This certification process maintains the precision, vibrancy and integrity of the Iyengar Yoga community the world over. Only Certified Iyengar Teachers are entitled to use the name of yoga master BKS Iyengar and his teaching method. An Iyengar Yoga teaching certificate is valid worldwide. The training is focused on both the personal practice of the trainee as well as developing an understanding of the Introductory Syllabus from a practice and teaching perspective, both with respect to the asana and pranayama. Six written assignments will be required for submission over the course of the training. The training is designed to take approximately two years, however, the nature of an apprenticeship means that an individual trainee may go at their own speed and tailor the program to a certain extent with respect to their other life commitments, family and career. The list of attendance requirements below is the minimum hours over a two year period. This may be used as a guide. * 3 classes per week, 30 weeks of the year, with one being a Beginners class. Initially the trainee will observe the class and when the skill level is deemed to be appropriate they will assist and then teach the class under Tamar’s guidance. Feedback will be given so that the prospective teacher may develop and improve. This is applied knowledge in action. *4 Saturday Workshops per year where personal practice may be more deeply explored and penetrated. $4360 for two years. Payments may be made in four instalments. Payments once made are not refundable. Email Tamar to register your interest.